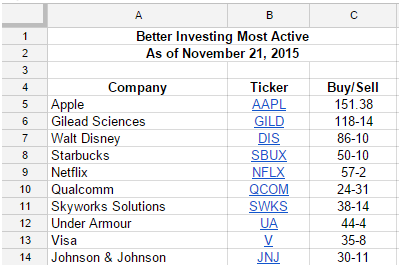 Periodically I detail the most active stocks reported by Better Investing members. Apple (AAPL) continues to be a favorite of Better Investing members, while Qualcomm (QCOM) is the only stock in the top 10 that is showing greater selling interest versus buying interest. New to the list since I list provided an update in August is Under Armour (UA), Visa (V) and Johnson & Johnson (JNJ). Dropping off the list is Southwest Airlines (LUV), General Electric (GE) and Ambarella (AMBA).